We are a leading Manufacturer of priyamina smart class from Chennai, India. 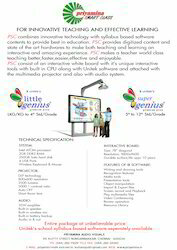 World’s most advanced, most accepted and most economical Digital Electronic Active Smart Class room solutions with fully syllabus based and highly interactive contents from Unitek will take your school to international standards at an unbelievable cost. The new generation schools and teachers need scientifically advanced, systematic and perfect technological tools and equipments to keep the space age students active, refreshed and motivated to make them learn the subjects 100 times better, faster, easier, effective and enjoyable. World class contents, techniques and tools developed by world renowned educational experts, mathematicians, scientists, clinical psychologists, graphic experts and engineers. Looking for SMART CLASS ?